On November 7, Chynna Ortaleza and Kean Cipriano tied the knot for the second time at the Hearts of Jesus and Mary Parish in Q.C. 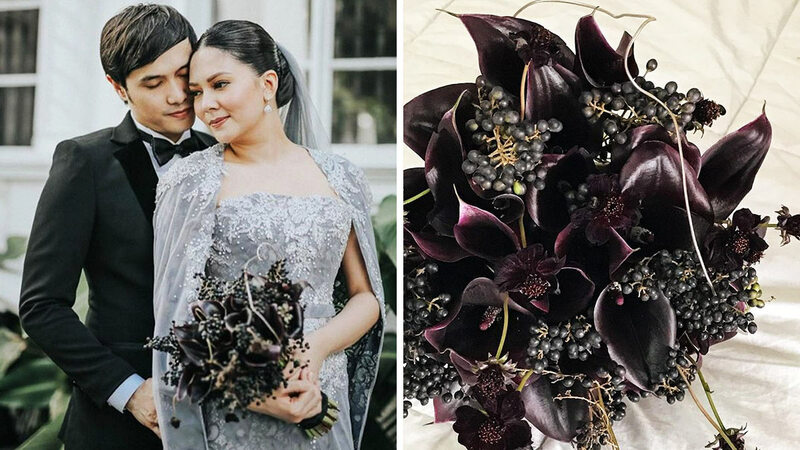 A non-traditional bride, Chynna carried a bouquet of plum (almost black) Calla Lilies, Cosmos, and berries down the aisle. (Editor's Note: Kean is the vocalist of Pinoy pop-rock band Callalily). Chynna continued, “Yeah, so when I met Teddy, the first thing I told him was, ‘Your bride hates flowers.’ Teddy was like, ‘Ok, we can do something non-floral.’ But then I said, ‘You know, I actually appreciate flowers when they’re dead.’” Despite her initial hesitation to carry a floral bouquet, Chynna eventually agreed as long as it wasn’t white or pastel.